Mr O'Brien, from Ladbroke Grove, west London, was arrested in Prague in February 2017. But he used the Italian alias of Enzo Mellonceli, supported by false documentation, and was bailed on allegations of criminal damage and assault pending further inquiries. 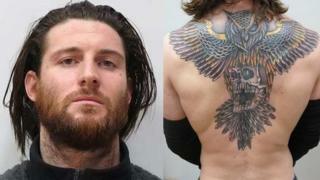 He also heads the National Crime Agency's "most wanted" list.Mr Hanson, from Kingsbury in north-west London, was found with a wound to the neck at the RE Bar, at about 01:10 BST on 11 October 2015. He was pronounced dead at the scene.A post-mortem examination gave the cause of death as haemorrhage, inhalation of blood and an incised wound to the neck.